Just 30km from Danang international airport, Hoi An Hotel occupies lush and spacious grounds in the heart of the old town. It is the ideal place to stay for anyone who comes to visit Hoi An and its surrounding attractions which include the area's other World Heritage sites, My Son Cham temple complex and the former imperial capital of Hue, which are both within easy reach. The four-star Hoi An Hotel offers 160 international-standard rooms, restaurant, bar, garden cafe, out-door swimming pool, conference rooms, business centre, tennis court, badminton court, fitness centre, Jacuzzi pool, sauna, steam bath, beauty salon, doctor on call, parking lot, laundry service, mail services, money exchange, limousine service, tourist desk, children's play ground, baby-sitting service, souvenir shop and art gallery. 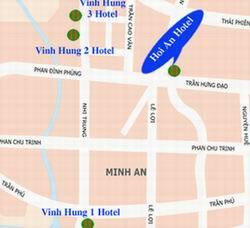 Situated in the heart ancient Hoi An, a few minutes from the market by foot and 1 km to the nearest bus station. Cua Dai beach is 4 km away, The Marble Mountains and Cham Museum is 40 km away, Myson is 45 kms away and Hue is 140 kms. Da Nang International Airport is 30 km away from the hotel. Add 15 US$ per extra bed. 20 rooms in simple decoration & garden view; 25 m2. 60 rooms in special decoration, with either garden view or swimming pool view; 30 m2 . 06 suites at each, a luxury living and one bed room en-suite in 60 m2 with garden or swimming pool view. Normal and popular, Hoi An food has its own nuance. The nice, different, unique dishes of Hoi An such as cao lau, luc tau xa, xi ma, quai vac... are appealing to anyone who first hear about them. Garden restaurant, Hoi an restaurant serve all your need: Western-Asian and local foods. Cafe bar, Swimming pool bar are the place for you to relax after day visit ancient town. Traditional music show at night.